Zürich, Braginsky Collection, B104: Elijah ben Salomon Salman, Kizur hechalot ha-keduschah („Kurzfassung [der Abhandlung über] die Heiligkeit der himmlischen Paläste“) (http://www.e-codices.ch/de/list/one/bc/b-0104). 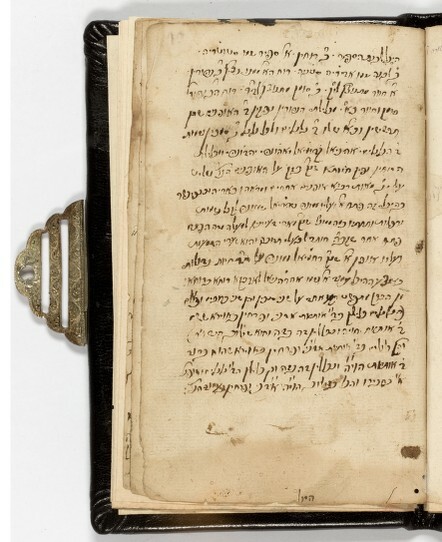 The text of this manuscript contains comments by the Vilna Gaon on a passage of the Zohar, the classic work of Jewish mysticism. The Gaon’s fame rests mainly on his contributions to Talmudic and rabbinic literature; it is less well known that he was also a great scholar of Kabbalah. The comments seen here were printed in the nineteenth century by one of the highly respected experts on the Gaon’s kabbalistic writings. In that publication, the beginning and end of the present text are clearly and explicitly marked as having been printed from an autograph manuscript (mi-guf ketav yad kodsho). Indeed, the marginal notes and the corrections in the Braginsky Collection copy appear exactly as in the printed edition, indicated by parentheses and square brackets. All other aspects of the manuscript, including even the dimensions of the paper, are identical with those of the other documented autographs. From: A Journey through Jewish Worlds. Highlights from the Braginsky collection of Hebrew manuscripts and printed books, hrsg. E. M. Cohen, S. L. Mintz, E. G. L. Schrijver, Amsterdam, 2009, p. 136. Schöne Seiten. Jüdische Schriftkultur aus der Braginsky Collection, Hrsg. von Emile Schrijver und Falk Wiesemann, Zürich 2011, S. 116-117. A Journey through Jewish Worlds. Highlights from the Braginsky collection of Hebrew manuscripts and printed books, hrsg. E. M. Cohen, S. L. Mintz, E. G. L. Schrijver, Amsterdam, 2009, p. 136-137.